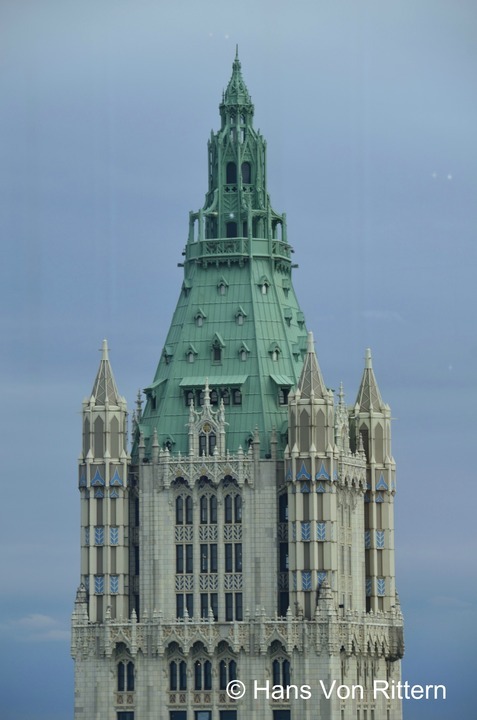 THE WOOLWORTH TOWER “IT ALL ADDS UP” – 100 YEARS OLD TODAY: On October 3, 2011 at 1:30 pm, ‘Open House New York’ gave me the rare privilege of going to the top of the newly finished World Trade Center #7. The floor had not yet been occupied and afforded me the breath taking views of the Woolworth Tower soon to be only the views seen by office workers in the building. It was a thrilling bittersweet experience. On April 24, 1913 Frank W. Woolworth completed what was then the tallest building in the world, 57 stories tall, on lower Broadway between Park Place and Barclay Street, opposite City Hall. He called it his ‘cathedral of commerce’. Decorated with the finest craftsmanship, artwork, gold leaf and mocking gargoyles. The exterior decoration was cast in limestone-colored glazed architectural terra-cotta panels. The completed height 792 feet (241 m). A breath-taking observation deck on the 57th floor was open to the public. It remained the tallest building in the world till the Chrysler Building was built in 1930, then only to be surpassed by the Empire State Building. The most wonderful part of the story is he paid the full price of the building upon completion $13.5 million dollars …in cash. . . in nickels and dimes! Mr. Woolworth was noted for saying “it all adds up!”. So the next time your mother tells you to ‘save your nickels and dimes’ – listen to her! 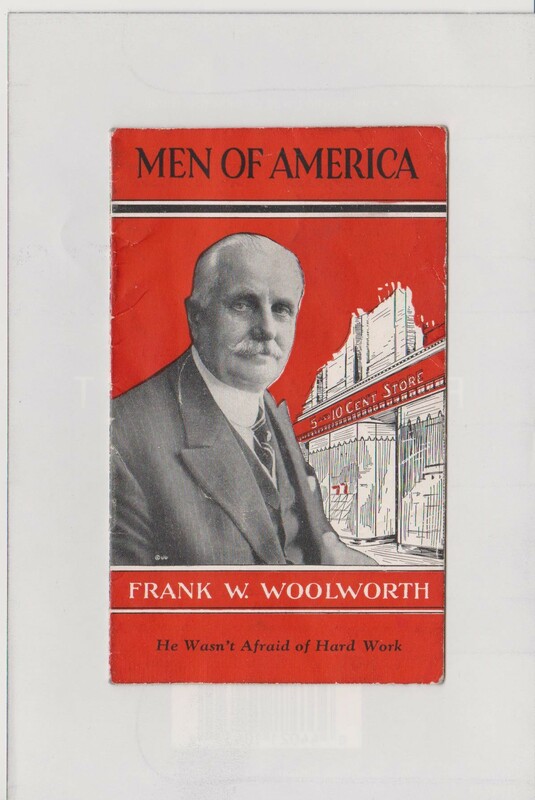 In my office at home I have a framed 1913 advertising brochure of Frank W. Woolworth who created one of the greatest financial empires in the world through his successful idea of ‘five and dime’ stores (our .99 cent stores of today.) I keep his brochure on my wall to remind me, it does all add up! Tragically the building today has fallen victim to the cancer that is NYU university, which has taken over the building and will let no none NYU persons into the building, not even to peek a the lobby (there are nasty bully guards at the door) and rare tours are only for the very few and high paying. Or – you could pay the average $65,000 a year price tag tuition to attend NYU and tour the building whenever you wish. It is disgusting that this tower based on the nickels and dimes of the working class has succumbed to the über elite. They have stolen our city treasure. It is the aftermath of the greedy era of mayor Michael Bloomberg and an even more dangerous villain councilwoman Christine Quinn. After NYU’s grab of the building, on July 31, 2012 an investment group led by Alchemy Properties bought the top thirty floors of the building. The tower will be turned in to 40 luxury apartments with a five level penthouse on top. Many people are looking for apartments in that area. The investment group says that the building historic status down town “has the catch to give it an edge over its competitors. “The luxury apartments will began at three hundred fifty feet from the ground level. Each apartment will have a view of lower and midtown Manhattan. The apartments will have ceiling heights that are about eleven to fourteen feet tall. A fifty five foot long pool in the basement will be restored for the use of the people who live there. The apartment is set to sell at seven and a half million dollars for about two thousand five hundred square feet. Over the entire project will cost one hundred fifty million dollars to build the apartments and plus the sixty eight million dollars used to purchase the space. . . a far cry from the days of nickels and dimes, those days are far gone.